That or which? or both? Elsewhere in this blog (search for: “A which hunt”), I referred to the different prescriptions for usage of which and that in British and American English. The American advice to “use that before a restrictive clause and which before everything else” suggests that that is assigned to restrictive and which to non-restrictive relative clauses. In British English, however, which can also be used in restrictive relative clauses (“Gems that/which sparkle often elicit forgiveness”, example adapted from Grammar Girl), and the distinctive feature is whether to use a comma or not before which (or who). although relative pronouns “generally admit a comma before them”, where two ‘members’ are clearly connected, “the comma should be omitted”, and he provides as an example A man who is of a detractory spirit, will misconstrue … (1795:164). Salmon notes that it was not “their concern with punctuation which eventually drew the attention of English grammarians to the syntax of relative clauses … but … the desire to clarify the written form of English which led to their recognition of the special syntax of relative clauses” (1988:294-5). Murray, interestingly, had been born in America, but he wrote his grammar within a British English context (and had been greatly influenced by British predecessors). Published in York in 1795, the English Grammar reached America five years later (Fens-de Zeeuw 2011), so the rule as cited here was originally available to American users too. What I’d like to find out is when the new prescription arose, and why? The site Gramar Girl which I am drawing on here should, moreover, be renamed “American Grammar Girl”, as the that/which prescription clearly does not apply to all varieties of English. It is, in other words, potentially an enormous source of confusion. Fens-de Zeeuw, Lyda (2011). 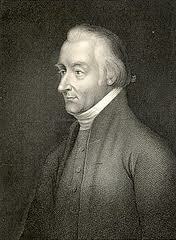 Lindley Murray (1745–1826), Quaker and Grammarian. Utrecht: Lot Dissertation Series. Salmon, Vivian (1988). “English Punctuation Theory 1500-1800”. Anglia 106/3-4, 285-314. Gallery | This entry was posted in usage features and tagged restrictive/non-restrictive clauses, which/that. Bookmark the permalink. 1 Response to That or which? or both? I immediately checked the last American edition published during Murray’s lifetime by his official New York publisher Collins & Hannay (1826: 180); the quotation “A man who is of a detracting spirit, will misconstrue …” is still identical to that in the first edition (1795: 164).